WOW! I cannot believe I got a DD out of this. Thank you so much everyone. I am regretting not putting up more artwork on this account now. Also I would like to give a special thank you to my close friend =DragonElement11 who was pretty much the mastermind behind this whole thing. I just put the template together. - For those who are picky about colors, there is an option for skin tone, eye, and hair color under the color option. This can be used for clothes colors. -'Colors associated with character' is if your character has a specific color that is related to them. For example The Simpsons=yellow, Superman=blue and red, Link=green, et cetera. - I feel that this part is easy to understand so I should not have to explain much about it. However, feel free to ask if you have a question. -This section is also easy to understand. It is just a collection of extra information. - Everybody finds it easier to visualize the size of something when it is compared to a familiar object. Characters are the same way. You can give a height and mass measurement, but it is always good to see what your character is like compared to a human so you can tell how the character might fit into our world. - There are 9 boxes where you may draw your character’s possessions. - You can use this to list your character’s unique traits. It can be anything from their gift of music to their ability to control minds. If your character is not super human just use this to list quirks or cool things your character can do. 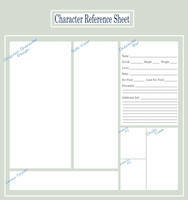 - Use this space here to include any extra information that must be known about your character. I do not use this to tell the character’s history because that would spoil the story, instead I use it for drawing extra views of the character like their different expressions or actions. It is all up to you as to what goes here. I hope you like my reference template that I made. I often have searched for a good template that I could use for any of my characters, but I could never find one that covered almost everything. I hope you can use this, so enjoy! *EDIT* (8/9/10) I forgot to distinguish the difference between the 'strengths' part in the 'information' section and the 'talents/abilities'. The strengths and weaknesses in the information part are supposed to be about your character's personality or bad/good habits. The talents/abilities are things your character can do or are good at physically. *EDIT* (10/11/10) I am getting the question 'What does orientation mean?' and the answer would be that 'orientation' means 'sexual orientation' like gay, bi, straight and so on. Imma use this but how tall is the human reference? 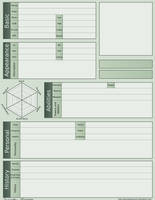 Will definitely be using this - at least as reference - for future character sheets, thank you so much!! I'm going to try using this to design a character and this character occasionally has suicidal thoughts (not diagnosed with depression, but has had professional help with it). Would things like this (and mental illness) go under "Weaknesses", "Talents/Abilities" (okay, probably not that XD), or "Extra"? Used it! 10/10 will use again! This is absolutely amazing!!! Thank-you! Thanks for this, I really needed it! Im going to use it for my Katsuma Fursonna Robot. It can be used with furries right? Going to use it and will credit, but how tall is the human comparasin model? I can't read it personally. Too small. Hallå, quick question if you get a chance to answer it. Um so can we edit the words? This template is exactly what I need for my characters BUT i would need to edit where is says, "Back, front, 3/4's" to "normal, battle form 1, battle form 2" and then change "extra" to "final form"
It looks like the person who made this hasn't been online in a few years. Used it! Might use it more in the future. Thanks! AWESOME! I already made one and I have a feeling it'll come in handy more than once. Really handy, I might actually use this one! Great job. Yeah this is the 3rd time now, you can go about your business plz. Rushed this one on purpose because I have another reference sheet done before. This deserves every practicality award. ever. Favorited. This template has everything you can imagine about a person's OC! okaaaayyyyy so yeah XD i wanna use this XD but i have 83 character! so i might use it 83 times! OwO! That's the link to mine. Thank you so much!!! It means what your sexual orientation is. If you are homosexual, heterosexual, or both.